I made 34 12 x 12 pages this weekend! Yeah I did -- it was sooooo exciting. And VERY busy - we had Kim, from Germany, with us for a few days.... and it had always been my plan to help her make a scrapbook of her time here. And time was just getting away from us. Since she was here for a few days, we made the most of it. We knocked it out. We first organized all her photos by theme (seemed much more fun than date), and then we started making divider pages for each section and she has lots of 4 x 6 open page protectors to fill up between the sections! It was so exciting - so insane, but so exciting, too. I felt happy creating a memory that will last a lifetime for her. I picture her children looking at it one day. Best of all - she loved it. She was so grateful and excited... she kept looking at it over and over which made me happy. I even sewed on the flag page - with my machine! I know people have done this forever... but man, I liked it. Here are a few of the pages that I loved. I included one of the 4 x 6 pages so you could see how cool they will look when Kim adds her photos and her touches. My Mom never asked for much. She never wanted for much either. She was completely content just having healthy kids, a fun life partner, and a happy family. 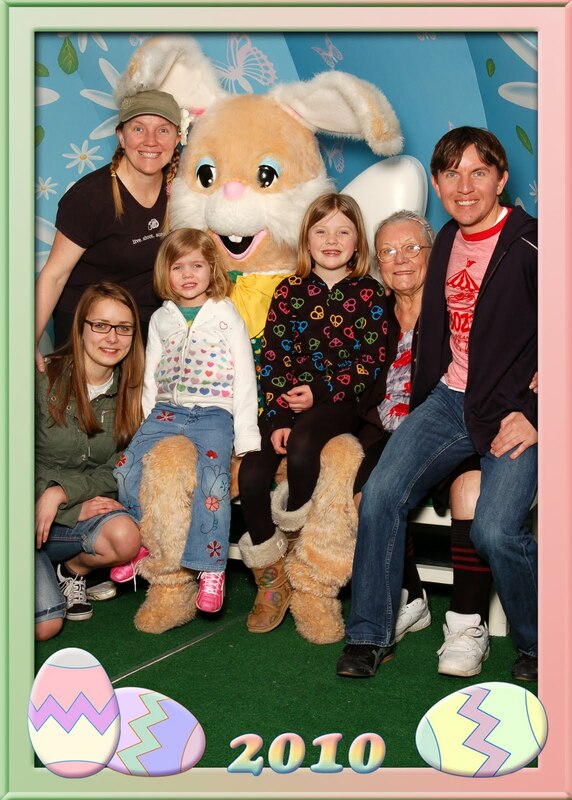 Seriously.... the only material thing she EVER ask me for EVER (well, other than grandchildren) was for each of us three kids (me, mindy, and matt) to get our picture taken with the Easter Bunny and Santa each and every year. So, there we were... 16 years old HORRIFIED to be seen at our local mall sitting on the bunny's lap, so we would drive to other towns. 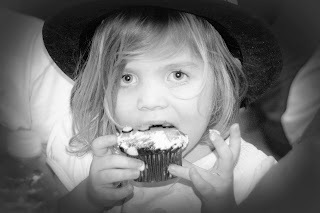 I thought she was insane... and yet, I will beg my children every year to do the same for me. These pictures are classic. They show exactly how we were at that moment in time. Who I was dating or friends with (because you know I drug them with me to random out of the way malls because I was not about to stand in line with a bunch of little kids alone). They show us. And, seeing a picure of kids with an easter bunny or santa will ALWAYS remind me of how happy simple things made my mom. Man, I miss her. In her honor today (as we do twice a year) I grab anyone around and force them to the mall.... today I felt lucky to have My Busia (my mom's mom), my girls, my brother Matt, and Kim - a wonderful friend of our family who is here from Germany on a Rotary Exchange (she is staying with us this week). It was fun. It was simple. It was expensive (but they gave me the photo on a little flash drive so I can upload it - very cool). And it was a tradition. A tradition I am happy to say I will never break. Man, I wish my mom was here for us to give this to. And, I hope I never forget how simple things can make someone very, very happy. In the Library of Memories Class (which I love love love) we were supposed to make a CONNECTIONS page last week. I sketched it, but just made time to make it last night. In the class you mix older and newer photos in a cool storage drawer system. I love it. I love having all these stories that come up from seeing photos together. I never would have thought of this page otherwise. Here is how the dresses looked from the front. And from the back. I could not believe how short it was on Kalli. Hope the shower went well today. I am currently taking a class called Library of Memories by Stacy Julian. I love it. I have read her book and sort of took the class before (did not do well actually following through with it). I had already moved my style into the concepts of having four main binders... Things We Do, Places We Go, All About Us, People We Love. I also have Sisters as a binder. I bought new binders (which I love) and today I made my divider pages. Here is a picture of my main binder cover pages. I will add pictures as I get more sorted so I have a variety of ages in the cover page. Here is a shot of my inside tabs. The papers match my binder color (well, not perfectly, but I am so over the need for scrapbooking perfection). I have them in the binders and am moving my pages in now. I LOVE IT. I even have purchased a black binder for annual Halloween costume pictures and a red one for Annual Christmas Card and Santa photos. I have three 8 x 8 binders, too. For FAVORITE pictures of Kalli and Kaya and one for the annual Daddy Daughter Dance pictures. I got all the divider pages completed for ALL OF THEM today. GO me! We had a super fun time shooting each other in Indy a few weeks ago. As I was sorting photos of the Library of Memories Class I am taking, I put this one in the ones to make sure I posted. Of course, we took this as an opportunity to CELEBRATE with her friend Maya and took them out to Red Robin and Cold Stone, too! OK, the day did not start out that awesome. I am stressed about work and the scale was TOTALLY not my friend. But, it ended up being one of those days you actually take a minute to thank God you got to live. 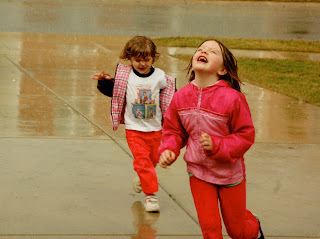 As Kaya and I were leaving school, it was pouring rain in Crown Point. I called Matt to tell him we were on our way and he said Kal was so excited for Kaya to come home so they could play outside. I was surprised because it was POURING by my school. By the time we got home, it was raining at home, too. Instead of making them stay inside, I let them play and PLAY THEY DID. 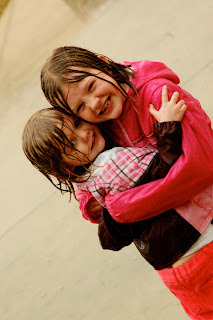 I took about 100 pictures of them just loving each other and really loving playing in the rain. 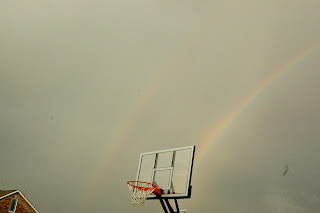 And, right before they came in for baths and dinner, the rain slowed and the sky above our house opened to show us a beautiful double rainbow. 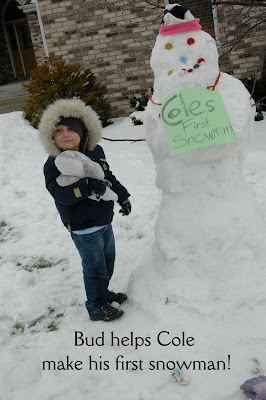 If I had not let them play outside... we totally would have missed it. I have always been sure that rainbows were a sign from heaven, and we got to see one tonight. And, I cannot WAIT to scrap these pictures. I felt lucky to be their mom and to be here watching them. I am taking a class with Stacy Julian (who I love) and I finally ordered binders for my Library of Memories albums (I have used this system for years, but stored my pages in temporary binders.) They came today and I LOVE THEM! I got a lot extra and put them in the attic because I would just cry if they discontinued Sky Blue and I needed another Sky Blue album. I cannot wait to move my pages into them sometime this weekend. I love scrapbooking this way. I wanted to end with a picture I love so much it almost makes me cry... this is a picture I get of Kaya because I am lucky enough to be her teacher this year in Pre-k.